La République de Panama est née par détachement de la Colombie en 1903, grâce à l’aide des États-Unis, qui y avaient un intérêt géopolitique, notamment concernant le contrôle de la zone du canal. Aussitôt, une petite force armée est mise en place. En 1904, jugée factieuse et putschiste par Washington, elle est remplacée par une Police Nationale. Pendant 48 ans, celle-ci, connaissant cependant un processus de militarisation croissant, sera la seule formation armée du pays. La Garde Nationale (GN) de Panama, née en 1953 est elle-même issue de la Police Nationale. Pendant quatre décennies, elle cumulera des activités traditionnelles de maintien de l’ordre intérieur avec les fonctions de défense nationale. La GN comportait quelque 9000 hommes répartis entre la Garde Présidentielle, sept compagnies d’infanterie légère et un escadron de cavalerie. L’équipement était presque entièrement américain. 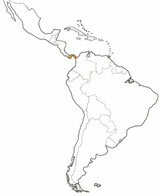 The Republic of Panama was created by a US-backed secession of the Panamanian isthmus from Colombia in 1903. Its army, established at the beginning, was soon disbanded by order of Washington (1904) and replaced by a more reliable paramilitary national police force, the Policia Nacional. During the following 48 years, this police force became increasingly militarized and was the only public security organization in the country. Headgear worn by these soldier-policemen included soft caps and some pith helmets. After the Second World War, as else-where in Central America, American military equipment became standard issue for the Panamanian defense and police forces. The Guardia Nacional (GN) was created in 1953 under the presidency of Jose Remon, former Police Commandant of the Policia Nacional. This new organization was responsible for both internal security as well as national defense. By 1973 the GN was organized into four infantry companies, which were often employed for political purposes by then strongman, General Manuel Antonio Noriega. The US M1 was in common use during this period, in most cases with a camouflage cover. 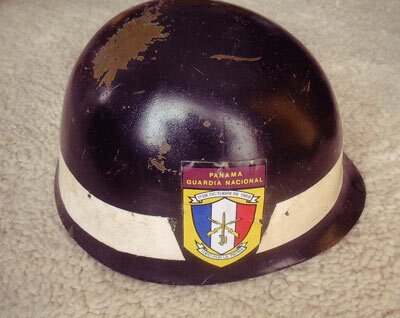 Helmet liners were decorated with a side emblem in yellow letters on a dark red background, reading, Panama Guardia Nacional. In 1984 the GN was transformed into a regular army called the Fuerzas de Defensa de Panama. In the early 1990’s after the invasion of the country by US forces to put an end to Noriega’s corrupt dictatorship, the Panamanian parliament voted to abolish the national army. However, in case of national emergency, a temporary defense force can be organized. 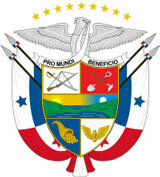 Currently, the Public Forces of Panama, duly controlled by the executive, include the following organizations: the National Police, the National Borders Service, the Technical and Judiciary Police, the National Guard, the Armed Institutional Service, and the National Air and Naval Service. These units are equipped with American- and sometimes German-made M1 helmets. Members of the Presidential Guard (PG), part of the National Police, use American pith helmets. Green M1 liners with copper front emblems representing the coat of arms of the country are issued to the officer corps. An Adrian-type lightweight helmet has also been worn by the President-ial Guard. Its liner, an Adrian M15-type, is made of brown leather. The PG members guarding the official buildings are equipped with white M1 models with the letters PG on the front and an image of the Presidential Palace on the left side. For the most part the armored vehicle crews of the National Guard currently use American DH-132 CVC helmets.